APPLICATION: Alumi-Flash with C-126 for one penetrations in one watertight unit. Alumi-Flash makes pitch pans obsolete! 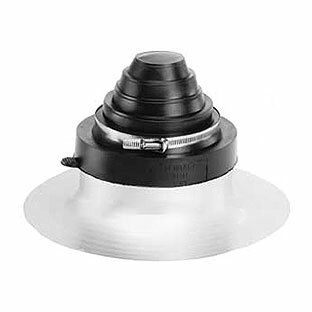 Portals Plus Alumi-Flash consists of a flexible EPDM cap w/Stainless Snaplock Clamp(s) and a one piece, spun aluminum base. The flexible EPDM cap eliminates roof leaks because penetrations can expand, contract, and vibrate independently of the roofing system. The EPDM cap is mechanically sealed to the Alumi-Flash base by a double "Weather-Tite Pressure Seal", which consists of two beads formed into the collar of the base that mate with double grooves molded into the inside of the cap. The Portals Plus Alumi-Flash provides a permanent, watertight, and maintenance-free means for penetrating roofs that is simple and easy to install. Adapter Rings can modify these penetrations. SPECIFICATION: The Standard Alumi-Flash includes a .060" spun aluminum base unit with a height of 4" and a base diameter of 14". The 8" collared opening has two beaded sealing rings roll formed into the top edge. An EPDM compression molded cap model C-126 is included which fits ONE pips of 2 to 6" diameter. All Caps have Portals Plus' stainless steel Snaplock Clamp.